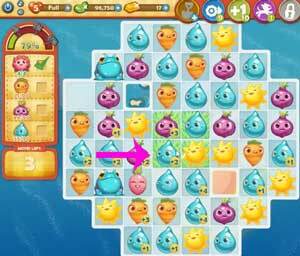 These Farm Heroes level 601 cheats and tips will help you beat level 601 of Farm Heroes. 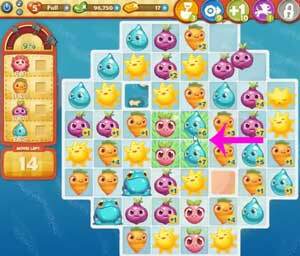 The objective of Farm Heroes level 601 is to collect four flowers, 90 carrots, 90 onions, and 90 water drops in 15 moves. In level 601, you must plant your own flowers before you can collect them. You can place the seeds anywhere you want, but it’s best to do it in the middle. This seems like a bad move, since it blocks off grassy squares. But as cropsies drop into the board, cascades will grow the flowers naturally and remove them from the board very quickly. You’ve got 270 cropsies to collect in only 15 turns, and that includes the time it’ll take to plant the seeds. You need all the help you can get. 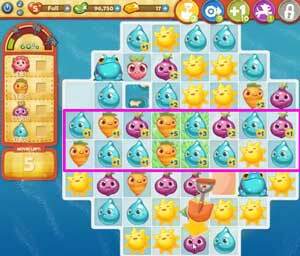 Collect all cropsies of a single type by making a match of five in a row. This will also simplify the board so that cascades are easier to trigger, which will collect the flowers faster. Once the flowers have been grown and collected, you’ll have your grassy squares. Use these to give lots of points to your required cropsies. You can also distribute points through matches of 4 or 5 if you can’t use the grass.